Wonder what it takes to have a new landscape designed and installed? Ross NW Watergardens just completed a large design-build project in Camas, WA. Follow along to see how we took this property from boring builder landscape to one of the coolest gardens we have ever created. Our client contacted us early in March 2018 about designing and installing a new landscape at his modern home. After the initial consultation we were hired to do a design for the whole property, and by the end of May the design was complete. 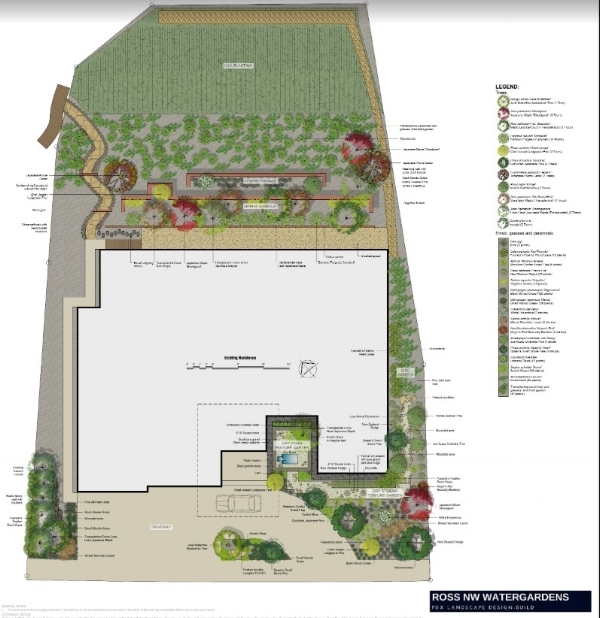 The new landscape plan included a modern dry pond and water feature, a copper basin water feature, boulder settings and plantings that are Japanese-influenced, cedar clad retaining walls, stone slab steps, and a modern take on Japanese moon gates. Our installation crews started the project in late July, worked through the summer, and completed the project in mid-October. Want to see how it turned out? Boulder grouping and mass planted grasses. Camas Washington modern front yard design build landscape project by Ross NW Watergardens. Dry pond and dry creek with Japanese maple. Modern dry creek with steel edging. Dry creek and mass planted grasses. Modern boulder grouping with shore pine. The wall appears to float over the slope. Retaining wall and screen in the backyard of this modern landscape. Moon gate and stone steps in the backyard. Fargesia robusta planted in front of the back screen. Retaining wall, screens, and stone steps give the slope form. Stone steps provide access to the slope. Ross NW Watergardens is ready to help you with your Camas, Vancouver, or Ridgefield landscape. Contact us today for a free consultation!